The reverend Quang Duc, a 73 year old buddhist monk, is soaked in petrol before setting fire to himself and burning to death infront of thousands of onlookers at a main highway intersection in Saigon, Vietnam, June 11, 1963. He had previously announced that he would commit suicide in protest against what he called government persecuton of Buddhists. 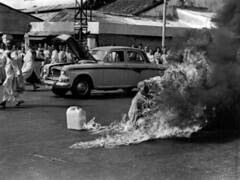 The supreme act of faith came after a long series of incidents between Buddhists and Saigon government authorities. The government denied descriminating against any religion. Banners carried by nuns and monks encircling the burning martyr read " A Buddhist priest burns himself for five requests". (AP-PHOTO/MALCOM BROWNE).